Sorry these photos are so crummy - it was kind of a last minute decision to go here since we won a gift card to this restaurant the night before and I didn't feel like making dinner...so I was unprepared, but now I am here to talk about the food! 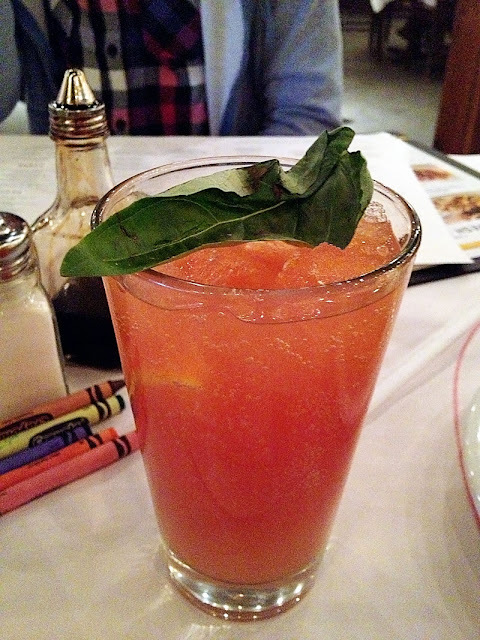 On a side note, I really should just give up on Italian restaurants. Or someone should just prevent me from entering them. It never ends well. 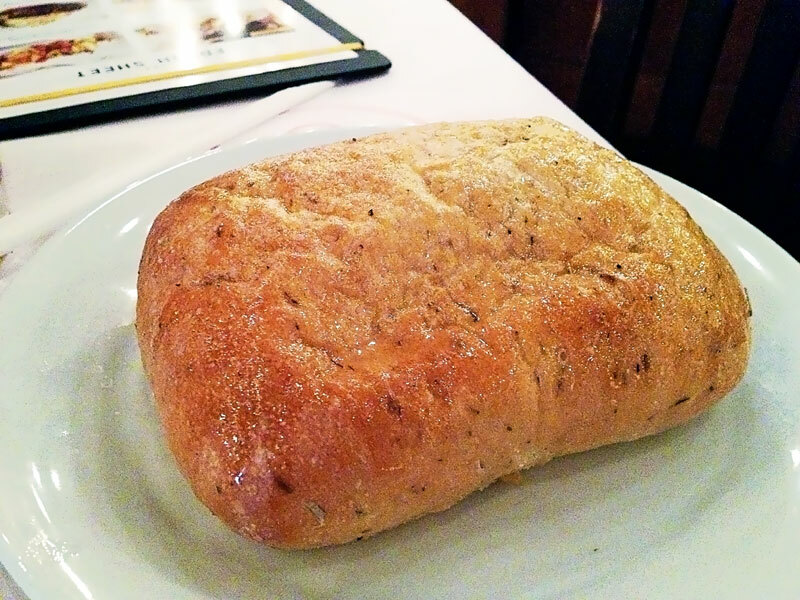 We started the meal with a hunk of bread big enough to serve a small family, and embarrassingly, chowed it all down at lightning speed because it was probably my favorite part of the meal. Yeah. Good bread, I must say. It was flecked with rosemary and probably doused in butter, and had a perfectly crispy exterior and soft interior. Everything you could ask for in bread, if you ask me! 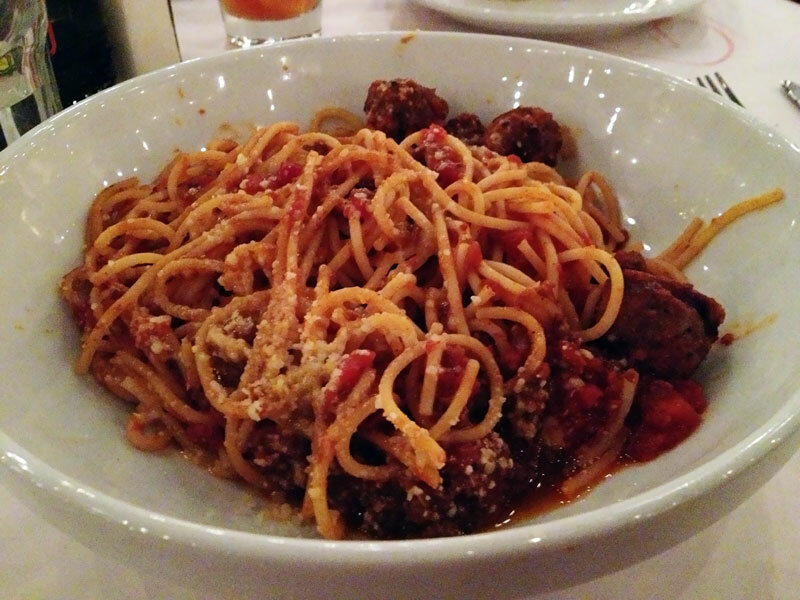 I ordered spaghetti and meatballs because I really couldn't think of a more classically Italian dish, and if you're going to go boasting yourself as Italian cuisine, I should hope you would do the basics darn well. Well. This is where the line of good things ended for us. The pasta was cooked fine, but the sauce was lacking (both in volume and in flavor), and the meatballs were just a source of sadness. They were a totally overcooked, completely lacking in moisture and goodness, and I'm pretty sure the kind you can cook from the grocery store are superior. Blaahhh. I didn't even finish this dish or want to take it home, which was pretty disappointing for overpriced pasta that I could have (and should have) made better in my own kitchen. Then Owen's dish, the Pasta Milano. 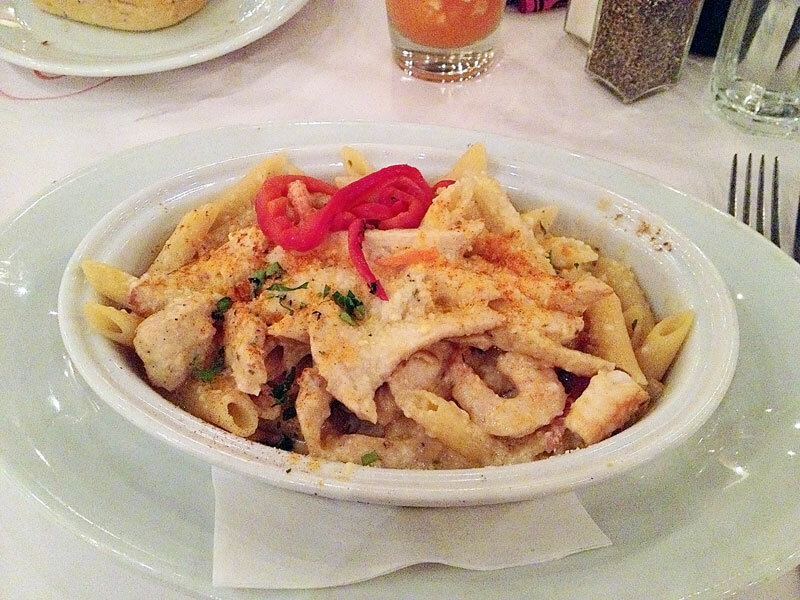 It was supposed to be some sort of chicken penne dish with white sauce and some array of vegetables I believe, but to be honest, all I can remember about it is SALT. I seriously have never had such a salty dish in my whole life, it was even saltier than Carrabba's! Another dish we didn't bother to finish, another dish we regretted. There is a fine line between hearty Italian food and a salt lick, and this place just went way beyond the boundary. What You Should Do: The quest for edible Italian food (beyond pizza) served in a restaurant that actually feels worth the hefty bill that often accompanies these sorts of restaurants STILL CONTINUES. Any suggestions would be highly appreciated. I should mention however, our server was very nice and friendly. 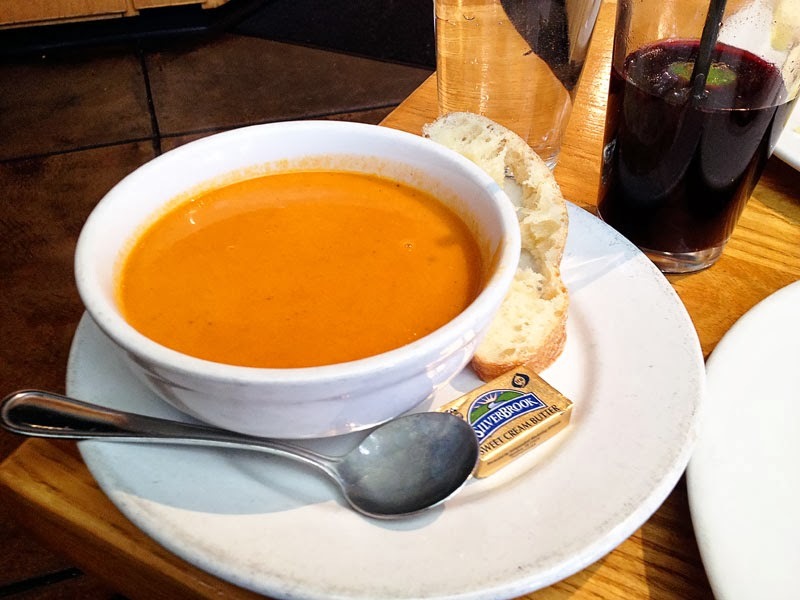 I am showing this picture in the order I wish I had received my food, rather than the order I actually received them...what is it with restaurants not bringing soup as an appetizer any more? Does anyone really want their soup once you're gotten your main dish? I just think its weird. Guess I'll just stop ordering soup. Anyway, I had read rave reviews on this soup, which is why I wanted to try it, but it really was kind of odd to our tastes. The fennel tasted a little soapy when next to the roasted tomatoes (and I'm a person who normally really, really likes fennel) and it was pretty cold once I got a third through it and just really was not very appetizing at that point. Meh. 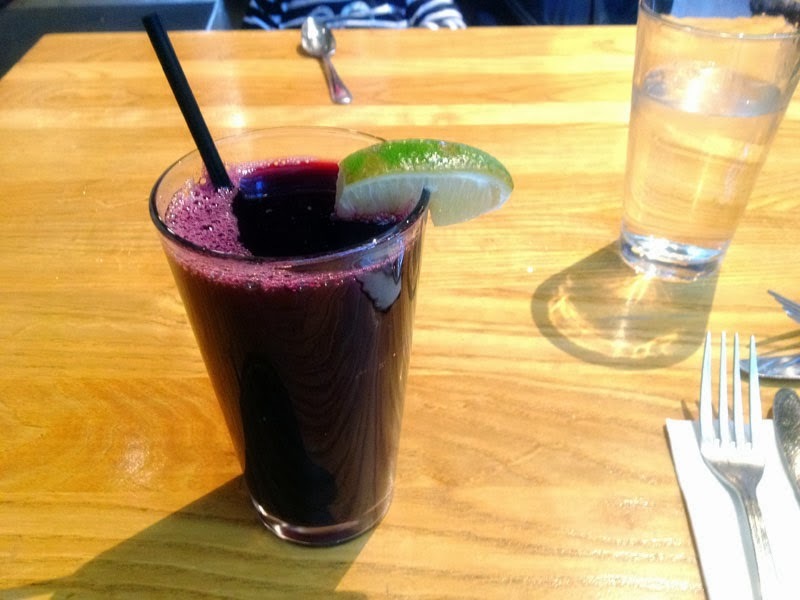 This blueberry pomegranate juice was probably the highlight of my meal -- yum! Wicked expensive of course, but I can imagine that it took quite a few blueberries and pomegranates to reach this point, so I am okay with it. Plus, it was delicious. Tara got the breakfast sandwich, which looked pretty tasty, though I am not sure if I will ever be able to eat a croissant here in the states ever again after going to Paris this summer...but it seemed nice, and even had some avocado on it that looked pretty tasty. 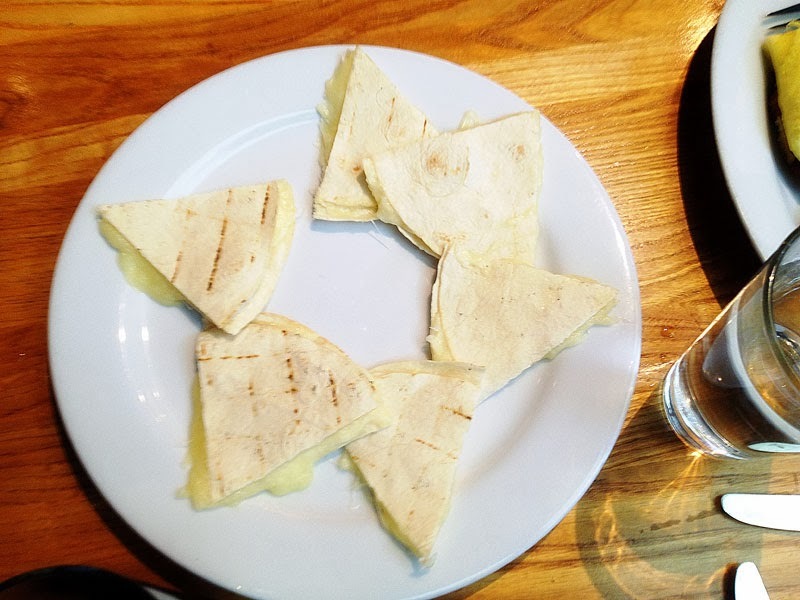 The quesadillas were...well...cheese between tortillas. 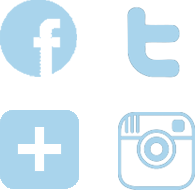 Can you really screw this up? At least they were arranged cutely on the plate I guess. No salsa though. Weird. 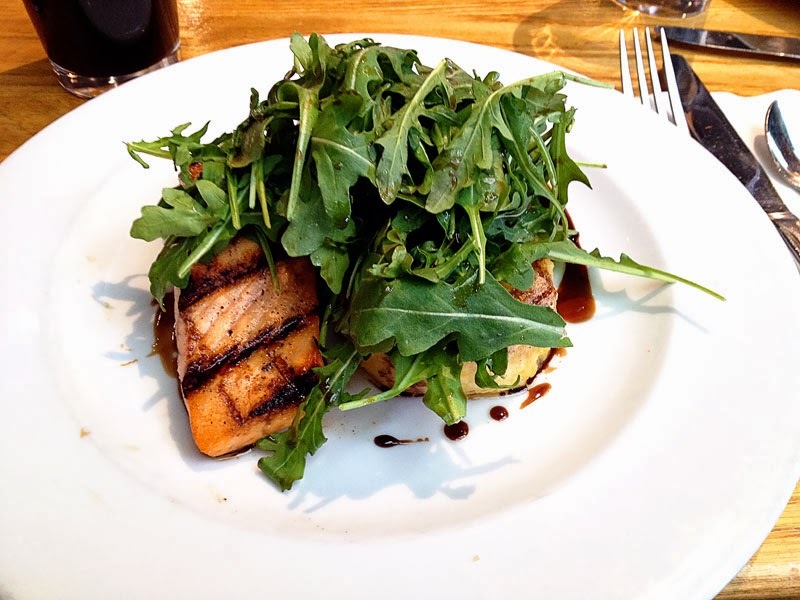 Then I ordered the grilled salmon, because it looked fun -- it was topped with olive-oil and merlot vinegar tossed arugula, and accompanied by a honey-lavender polenta cake and saba (a syrup made from freshly squeezed grape juice). I like weird floral food, so the polenta cake was probably my favorite part of the dish. It was slightly sweet and original and nicely cooked. The salmon tasted a little overcooked and dry to me, but I like it rarer than most people, and the arugula just kind of felt like a presentation afterthought. The weirdest part of the whole dish was how sweet the salmon was -- I couldn't tell if it was the saba or if they put honey on the salmon as well, but it was just a little too sweet for me personally. Maybe it would suit others fine, but I'm a pretty big sweet lover, so it may just be a little too much. The service was mediocre -- aside from getting my soup super late, they sat us next to the back door where staff members kept coming in and out, even hitting my chair twice, which was a little awkward. Sorry to be in the way? 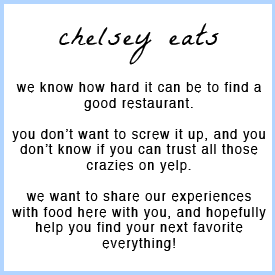 What You Should Do: I know a lot of people go crazy if I post about places in Salt Lake, but don't worry, I'm not forcing you to make a trip up here for this one. I can't really say it was worth the drive, so you are welcome for saving you from a trip and a mistake. Not to mention it was pretty expensive. 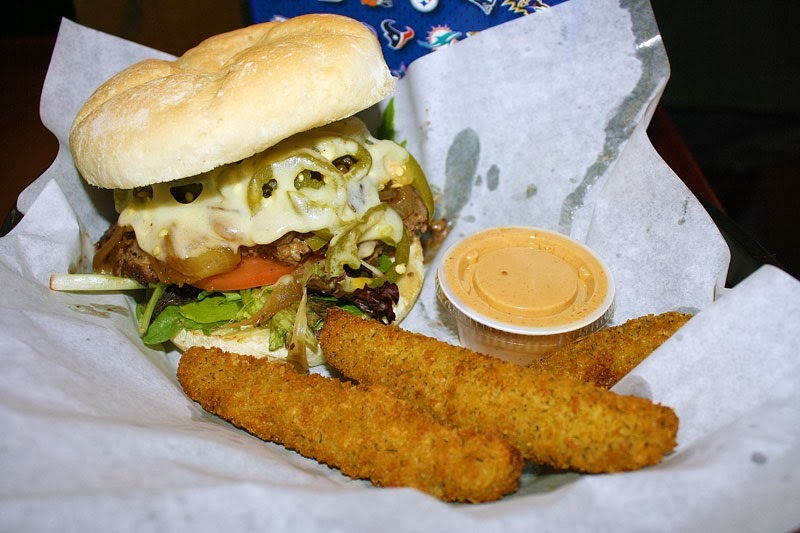 If you're vegan and always find a shortage of places to eat out, then maybe Oasis Cafe would be a good place for you, but I'm not so I'll probably won't choose to eat here again. 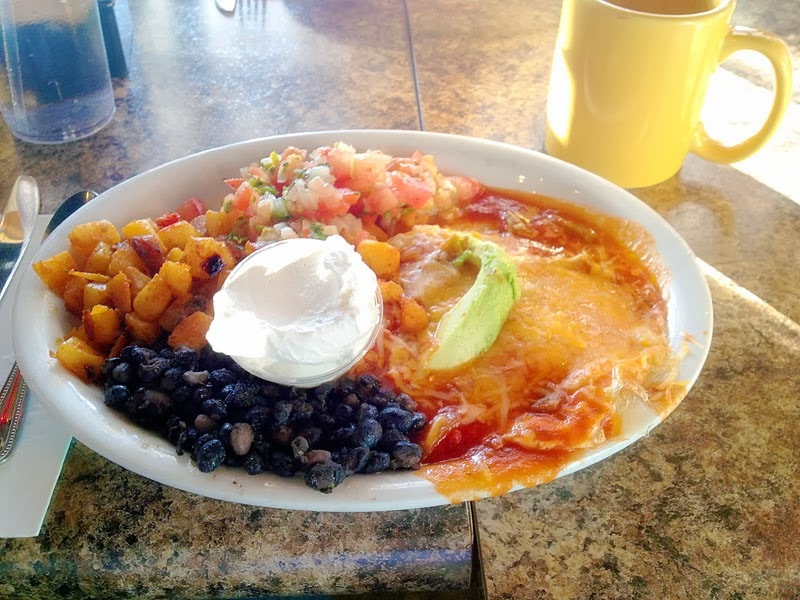 One of my all-time favorite splurge breakfast dishes is Huevos Rancheros -- eggs on tortillas with tasty sauce, beans and salsa. YUM! Obviously the portion sizes here at Eggs in the City are enormous, so it has that going for it, and my dish was reasonable in flavor. I've definitely had better, and I've also definitely had worse, it was just kind of middle of the road for me. 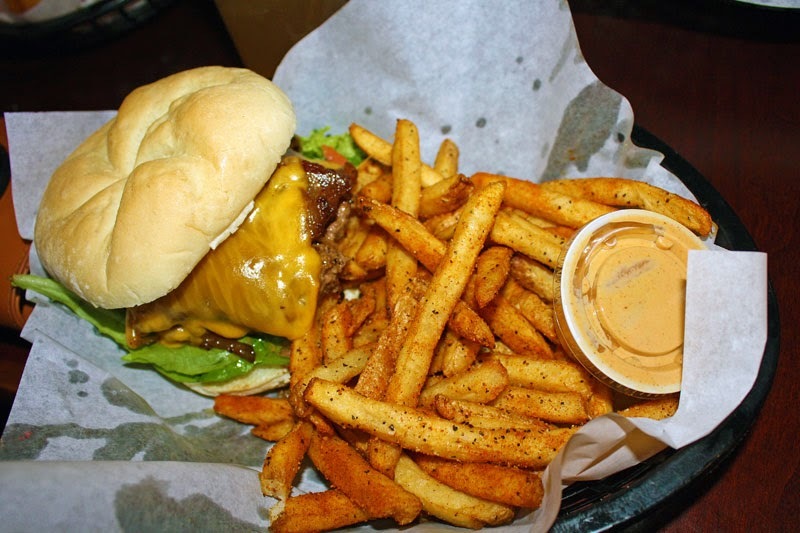 Mmm saucy. 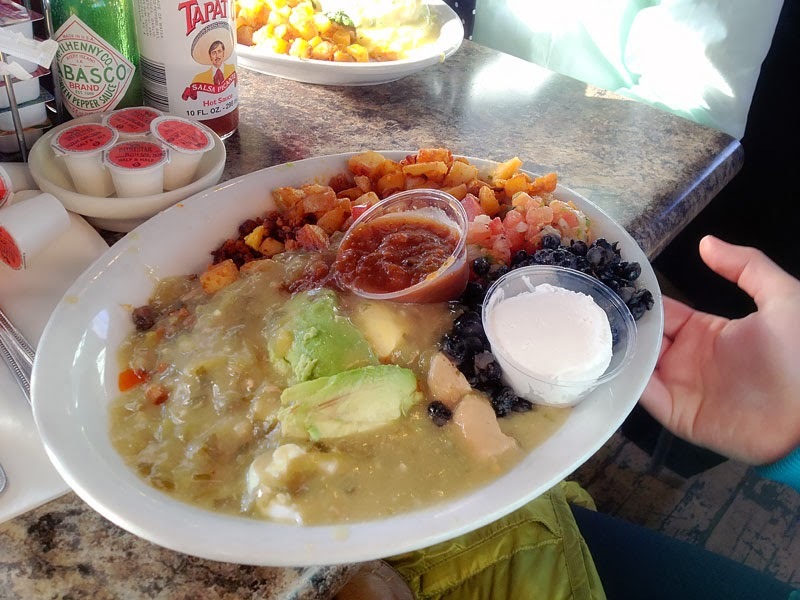 This was another twist on Huevos Rancheros, with a verde sauce instead. I like green sauces a lot, so I kinda wished I had ordered this one instead! 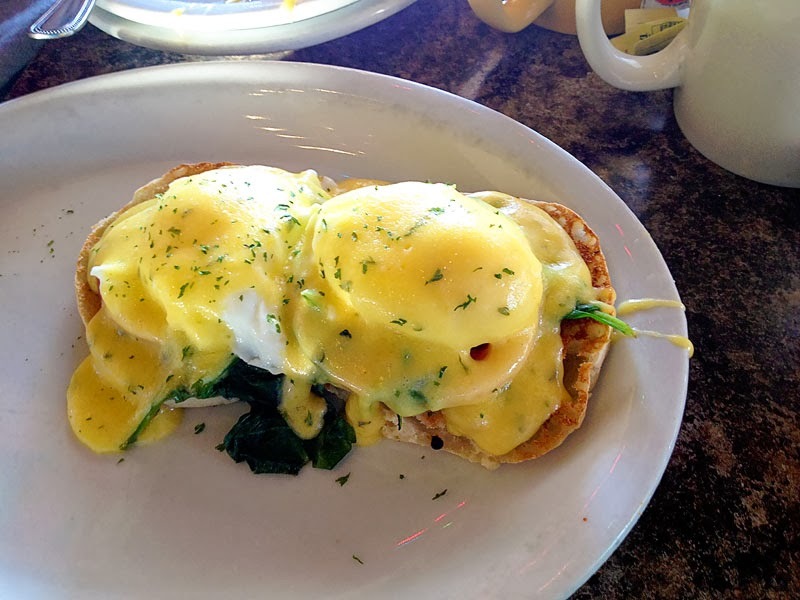 They have a couple versions of eggs benedict, including the florentine with spinach and tomato. 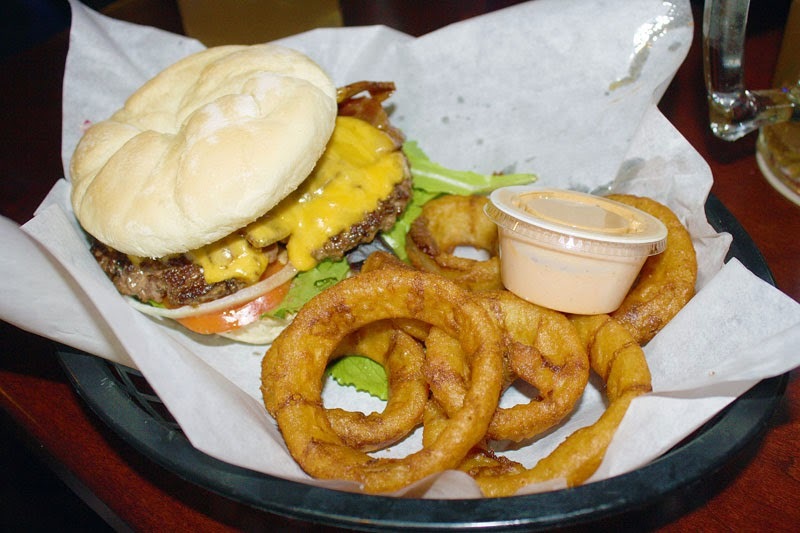 A nice lighter twist on a delicious dish! Ummmm talk about a meaty omelette -- I think there is more meat than eggs in this dish! It was pretty intense, but for those who are super meat-lovers, I really can't see any better options than this for you! 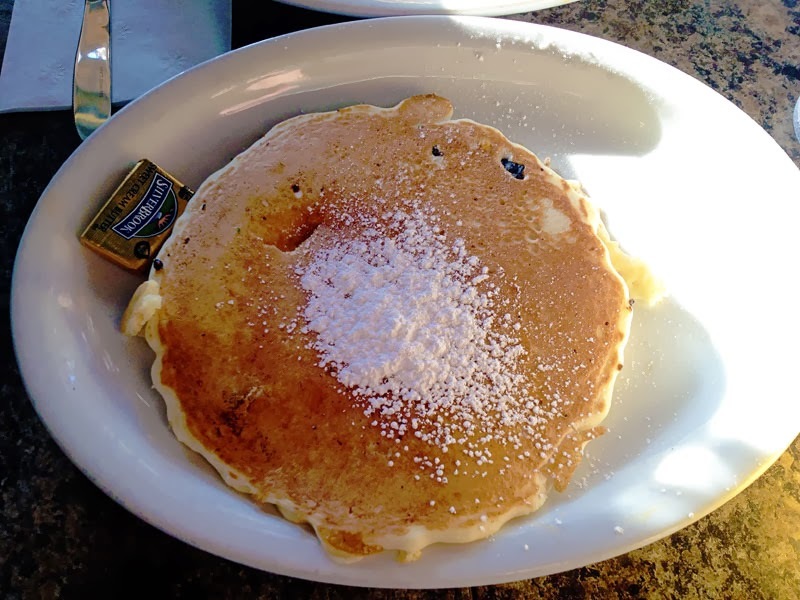 Oh, and did I mention you can order a side of pancakes? Ummm yeah -- this pancake above is the SIDE DISH. 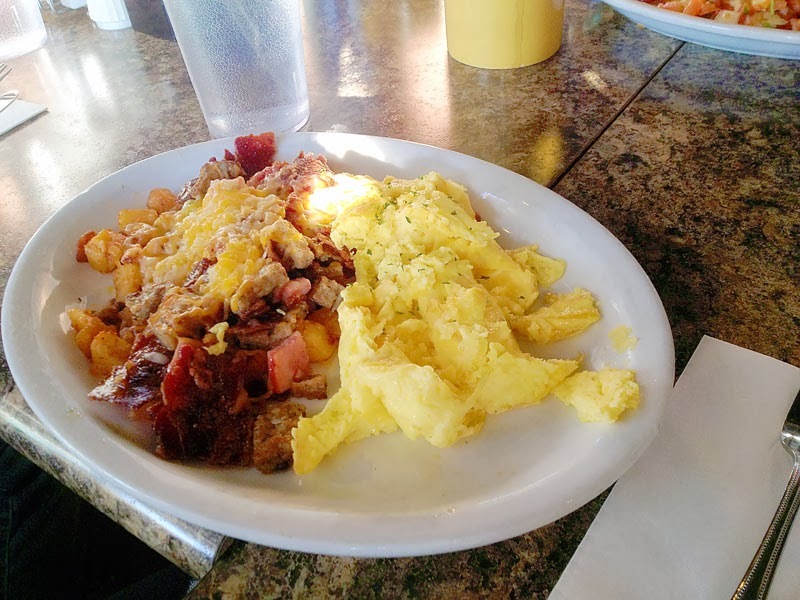 It kind of looks like a main dish, but if you're into that kind of thing, you can definitely get two breakfasts for one! They also have regular eggs benedict, if you're into that kind of thing :) The eggs were poached perfectly, and everyone who went with the eggs benedicts were totally satisfied. 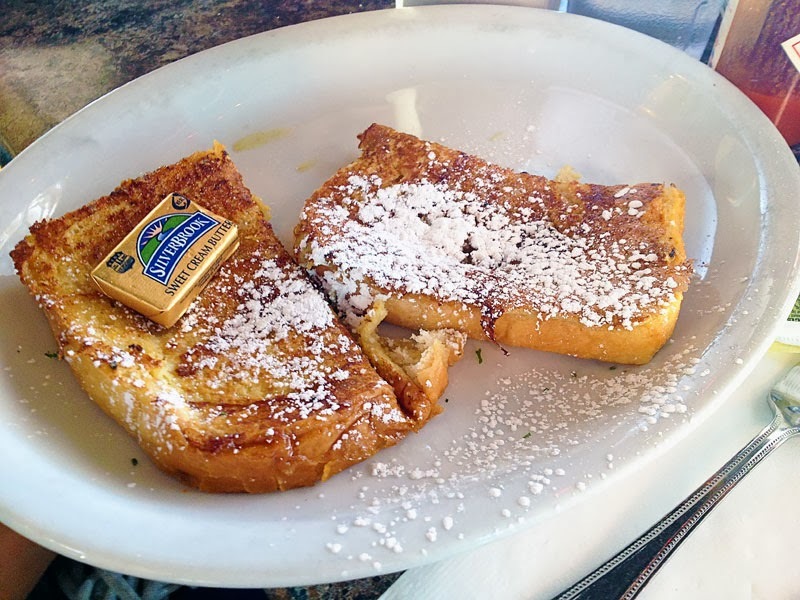 Also you can get a side of French toast - yep, another side dish! 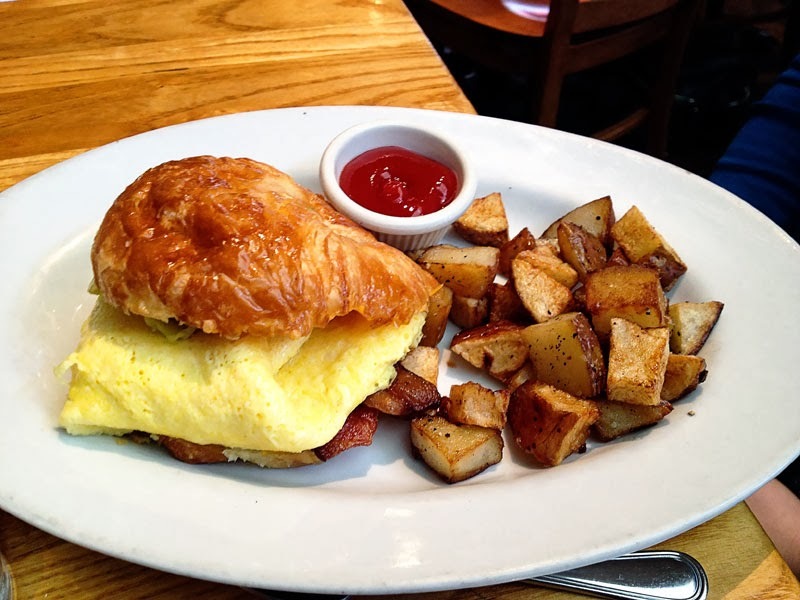 What You Should Do: If you're in the neighborhood, Eggs in the City could be a decent choice. It's a pretty small restaurant and we definitely had to wait with such a big party (I couldn't believe how busy it was on a weekday at 10! 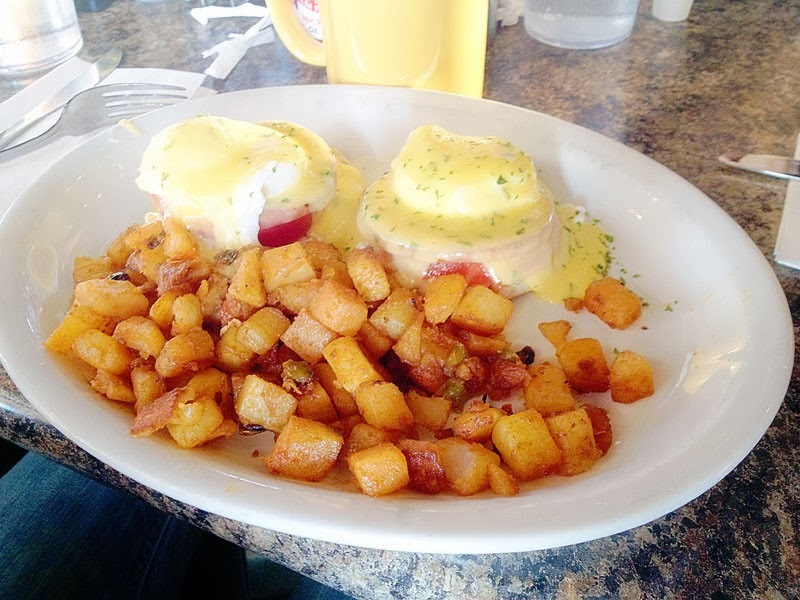 ), and the flavors were pretty decent, so it could be okay, especially if you're in the mood for eggs benedict, which seemed like the best prepared dish in my opinion. The dishes were pretty large, but definitely not on the cheap side, and I don't know about you, but every breakfast food seems weird to take home and reheat (microwaved eggs? bleh) so I don't know if I'd really want leftover breakfast.